Sonja Kristina is perhaps best known as the lead singer of seventies progressive rock band Curved Air. With this band she achieved chart success, notably with the single 'Back Street Luv'. Following Curved Air's demise in late 1976 Sonja toured with her own bands and also pursued an acting career via stage plays and TV. In the eighties, she discovered a new hybrid of folk and psychedelic music and formed a new band called 'Sonja Kristina with Ty-Lor and Friends.' They achieved some success, not least rave reviews at the Glastonbury Festival. In 1991 Sonja recorded an album of material and a promotional single 'Anna' and 'Devil May Care'. This was followed by an 'acid-folk' reworking of the aforementioned Curved Air classic, 'Back Street Luv', and some other Curved Air songs including 'Melinda(More Or Less)', 'The Purple Speed Queen' and 'Midnight Wire'. 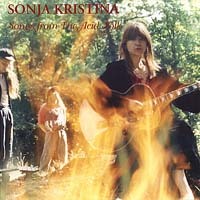 This Market Square release of Sonja's 1991 album includes three bonus tracks including 'Back Street Luv'.